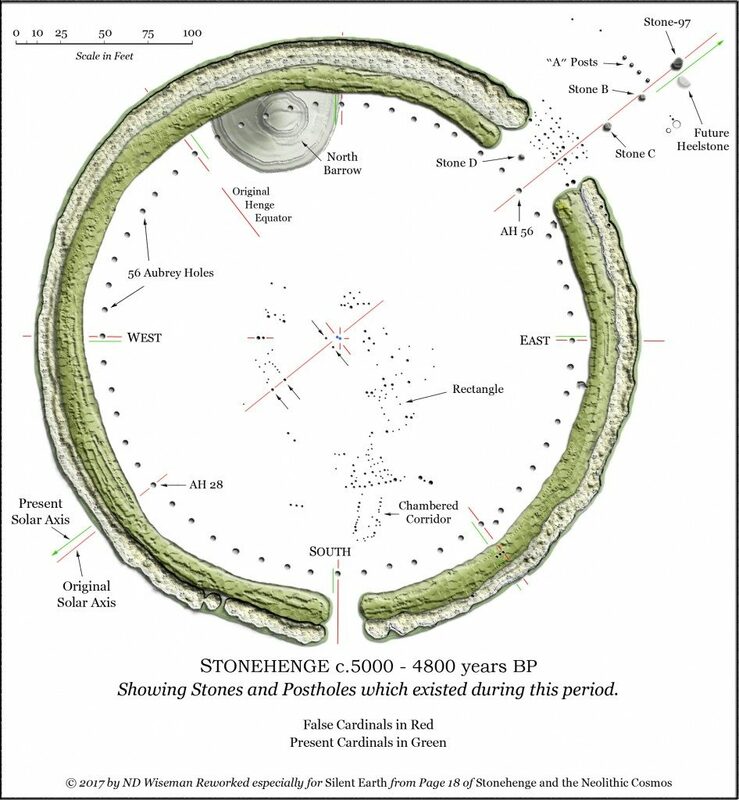 Last year, N.D. Wiseman, the Stonehenge expert and author of Stonehenge and the Neolithic Cosmos kindly sent me a detailed illustration he has crafted of the features, stones and post holes that existed at Stonehenge approximately 5000 years ago. Of this time, Aubrey Burl writes, ‘The beginning of Stonehenge is an introduction to confusion. It is a kaleidoscope of shifting images, of which only one can be correct … The early site is as insubstantial as a garden cobweb after rain, shimmeringly attractive but broken with holes and torn threads’. 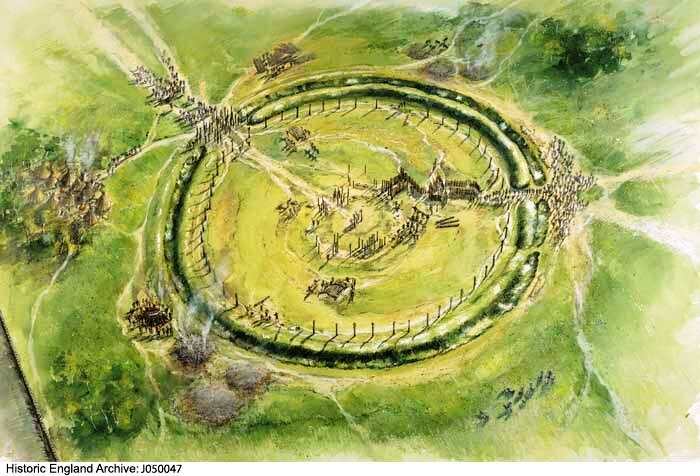 ‘It is possible that features such as the Heel Stone and the low mound known as the North Barrow were early components of Stonehenge, but the earliest known major event was the construction of a circular ditch with an inner and outer bank, built about 3000 BC. This enclosed an area about 100 metres in diameter, and had two entrances. It was an early form of henge monument. Within the bank and ditch were possibly some timber structures and set just inside the bank were 56 pits, known as the Aubrey Holes. There has been much debate about what stood in these holes: the consensus for many years has been that they held upright timber posts, but recently the idea has re-emerged that some of them may have held stones. Firstly, the thicket of posts at the northeastern entrance (the upper right of the illustration above) have been the subject of a huge volume of work, covering such theories as an eclipse predictor, mortuary arrangements, turnstiles and observation posts tracking the movements of the moon across its 18.6 year lunar-long cycle. At present, I personally find the last of these suggestions the most appealing. As can be seen from the above illustration, there are two internal pairs of post holes on the original solar axis of this Stage 1 that may have served as sighting posts for astronomical observations. The interior post holes offer the fascinating possibility that wooden structures were constructed and in use for a period of time on the site before the construction of the sarsen stone circle we are familiar with today. Perhaps before I speculate further on the subject of the post holes, a little more of what we do know of Stonehenge at this time and earlier is considered, i.e. radiocarbon dating of animal and human remains discovered at the site. The following radiocarbon determinations are summarised from the English Heritage Research Report Series no. 1-2012 Stonehenge, Amesbury, Wiltshire: Chronological Modelling report available here. From Aubrey holes 32 and 7, two cremated fragments of human bone were included, again giving calibrated date ranges with a 95% confidence level of the years 3330-2890BC. (Table 1 Page 22). There is a possibility that the Aubrey holes predate construction of the bank and ditch, which has been suggested due to the spacing in the circle taking no account of the north east entrance. The auroch skull placed near the terminal at the southern entrance forms a tantalising crossover with the earlier Mesolithic activities in environs. The relationship between man and auroch in the earlier Stonehenge landscape is outlined here. The cattle jaw bones were placed each side of the southern entrance. It has been suggested that structured deposits such as the above may have been curated and retained for a number of generations before being brought to Stonehenge. If this is the case, then for whatever reason they were initially retained, and eventually carefully placed near the ditch terminal of the southern entrance at Stonehenge, we can never know for sure. In Stonehenge, published in 2006, Aubrey Burl writes, ‘Objects of great age were deliberately buried in the ditch at both entrances. It infused the brand new with the wrinkled evidence of antiquity, converting the earthwork to an ancient monument’. The mortuary house at Fussells Lodge included an ox hide complete with an ox skull draped over it. Only one sample was accepted for this modelling of the chronology of Stonehenge relating to the timber phase, a pig rib fragment excavated by Col. Hawley between stones 8 and 9, dated to 2580-2460BC. Post holes and stake holes are not depositional contexts and some caution has to be exercised over dating the timber phase from this bone alone. Amongst the radiocarbon determinations that were rejected in calculating the chronology of the monument in the above report is an anomalous animal bone, sample number OxA-4902, described as a ‘cow-sized long bone fragment’, (possibly that of an auroch) that was discovered in the sarsen circle amongst the packing stones of stone hole 27, dating from the elusive late Mesolithic/early Neolithic ‘twilight period’ of 4350-3970BC. The report adds, ‘the result is much earlier than the digging of the ditch and as a single bone must be residual.’ It does, however, beg the question: Was this curated bone deliberately placed amongst the packing of stone hole 27 and, if so, why? Aubrey Burl describes the dating of this bone as ‘astonishing’ and suggests ‘such relics may have been pillaged from long barrows as hallowed remnants of an ancestral past, procuring rather than curating’. Stage 1 is attributed to date ranges of 3100-2920BC to 2965-2755BC, representing the middle to late Neolithic. The initial construction of the Stonehenge ditch is estimated to have been completed in 2990-2755BC and probably 2955-2830BC. The latest dated cattle and red deer bones were 5-435 years and probably 110-360 years old before being placed on the bottom of the ditch near the entrances shortly after it was cut. (Perhaps this tradition is also reflected on one later occasion with the ‘cow-sized long bone fragment’ being placed amongst the packing of stone hole 27 during the construction of the sarsen monument some 300-500 years later). Within the enclosure is a circle of 56 Aubrey holes, associated with cremation burials, likely to have originally numbered in excess of 150. The cremation from the chalk packing within Aubrey hole 32 is probably earlier than the digging of the ditch. This raises many questions, the most obvious being: Why were the remains of this person who had been cremated before Stage 1 of Stonehenge had been constructed placed here? The 56 Aubrey holes are broadly contemporary with the digging of the ditch. The cremation burial of a middle aged woman placed next to Aubrey hole 7 has a 98% probability of being earlier than the ditch. Stones were probably present at the site from its inception. The stone that stood in stone hole 97 outside the northeast entrance, together with the stones that occupied stone holes B and C — all presumably sarsens — may also tentatively be assigned to Stage 1. The stone in stone hole 97 sat within a filled linear depression which might have been a solution hollow formed beneath a recumbent sarsen. Some of the pit, post holes and stake holes within the earthwork enclosure no doubt also belong to stage 1. The southernmost group (of post holes) forms a passageway leading from the south entrance through the earthwork enclosure through a facade of posts towards the centre of the site. The spatial patterning of post holes in the centre is suggestive not of a circular structure, as might be expected, but a series of separate structures of which three appear to be rectangular in shape. Structure 2 northeast of the passageway, has a stone hole near the centre. A sixth structure in the northeastern entrance comprises a rectangular arrangement of more than 50 posts, the ends of which have been truncated to the east by later modifications to the main earthwork. Parallel to the axis of this structure some 20m out to the northeast, is a line of four post holes at intervals of 2m. The stones that once occupied stone holes 97, B and C, already mentioned, may also be part of this structure, as may the north barrow and another low mound of 16 by 14m (may be a spoil heap). Culturally, the activities of Stage 1 are associated with the users of Grooved Ware pottery. On the central right of the above illustration (viewing from the west) is the southern entrance, to the left of which, inside the ditch and bank, is the southern entrance passageway, clearly leading to one of the ‘rectangular structures’ which is standing towards the central area here. Two questions immediately spring to mind: What were these structures, and why were they built? On page 99 of Aubrey Burl’s Stonehenge, he writes ‘In discussions of this earliest period of Stonehenge, death is a central issue. Between the closing of the long barrows and the raising of the round ones several centuries later, there is a Dark Age on Salisbury Plain, an almost complete ignorance of what happened to the dead bodies of important men, let alone of other men and all the women and children … Whether the bodies were buried (individually or in groups), cremated, exposed to scavenging animals or thrown into rivers little is known’. Since it has been factually established that the circle of 56 Aubrey holes are associated with cremation burials and are likely to have originally contained the ashes of up to 150 people from this era, it is not unreasonable to move one step further in thinking and assume that these rectangular structures were in some way associated with the funerary process. Newly deceased bodies were placed high on excarnation platforms to be ‘bird scattered’ and initially defleshed by way of a ‘sky burial‘. This first separation rite frees the body of flesh. These platforms were erected nearby on the banks of the river Avon, possibly on an eastern section of Vespasian’s Camp, the cliffs at nearby Lords Walk, and close to Durrington Walls. After a period of time when the bodies had been defleshed by birds, the remaining bones were removed from the platform and any fleshy remnants removed by a process of final cleansing in the river Avon and, at certain times of the year, perhaps in occasional local springs such as at Blick Mead. This final cleansing of any flesh from the remaining bones was perhaps seen as allowing the soul to part from the corpse in readiness for its journey. At an appropriate time, perhaps the next of the eight seasonal prehistoric agricultural festivals or during a following significant lunar event, the remaining bones (primarily the skull and long bones of arms and legs) of the ancestor were carried from the banks of the river Avon to Stonehenge, where they were placed in a charnel house such as illustrated above for a certain period of time for display and curation before final disposal by cremation, days, months, years or even generations later. This activity provided the community with an opportunity of a procession serving the dual purpose of separating the ancestor from the living community at Amesbury and being reunited with their own ancestors at Stonehenge. The period of display of the bones in the charnel house for an unspecified period of time before final cremation perhaps represented a final period of transition, ‘a vigil-type area’, after leaving the land of the living at Amesbury and finally taking their permanent place with the ancestors in the Otherworld. The original processional approach was made from Amesbury via the southern entrance, as illustrated by Peter Dunn above, and not the northeastern entrance, which later became the western terminal point of the ‘processional’ route we know as the Stonehenge Avenue. This idea is not as far fetched as it may first appear to our 21st century sensibilities and the practical reasons for utilising this method of disposing of the body of the deceased at this time in the Neolithic is explored in Stonehenge and Sky Burial, an article by Ken West. As a funeral director, Ken West is a gentleman who has spent his whole career dealing with the practicalities of the funeral business. During the excavations of the Stonehenge Riverside Project, it was suggested in an interim report of the 2007 investigations that a ‘four post in a circle’ structure excavated southwest of Durrington, known as Durrington 68, was possibly a ‘mortuary platform’, adding that its function was ‘subject to debate’. Another puzzling aspect of the 400-500 years of this first phase of Stage 1 of Stonehenge before the sarsen stones were erected that does not sit comfortably in its chronology but warrants mention is that there is evidence of a period of abandonment of the site, when human activities were possibly transferred to nearby Coneybury Henge, a subject of one of my first blog posts here. Evidence suggests that after only a short period of usage, the early Stonehenge site was possibly abandoned and deserted to the elements, followed by a rapid recolonisation by scrub, bushes and rank grass. The wooden structures were left to decay and the ditch and bank to erode. Particularly, from snail evidence and various archaeological investigations on-site (first suspected by Col Hawley in 1921), it is now generally accepted that there was a period during the early third millennium BC when the Stonehenge site was subject to human abandonment, which I do not propose to explore in detail in this article. The original solar axis of this Stage 1 of Stonehenge centred on stone 97, whisked by stones B and C, passing uninterrupted through the entrance post holes of the northeast causeway over Aubrey hole 56 and out of the monument after passing over Aubrey hole 28. The original axis is shown in red in the illustration below, kindly provided by N.D. Wiseman. 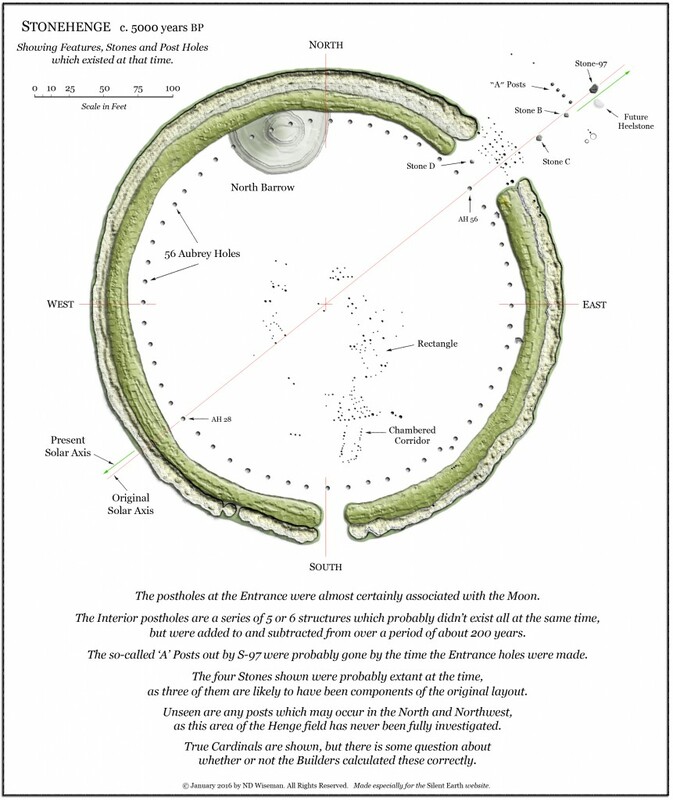 A detailed explanation of subsequent adjustments to the axis of Stonehenge during later stages of its evolution are explored in N.D. Wiseman’s Stonehenge and the Neolithic Cosmos, from which the author has kindly allowed reproduction of page 19 below. 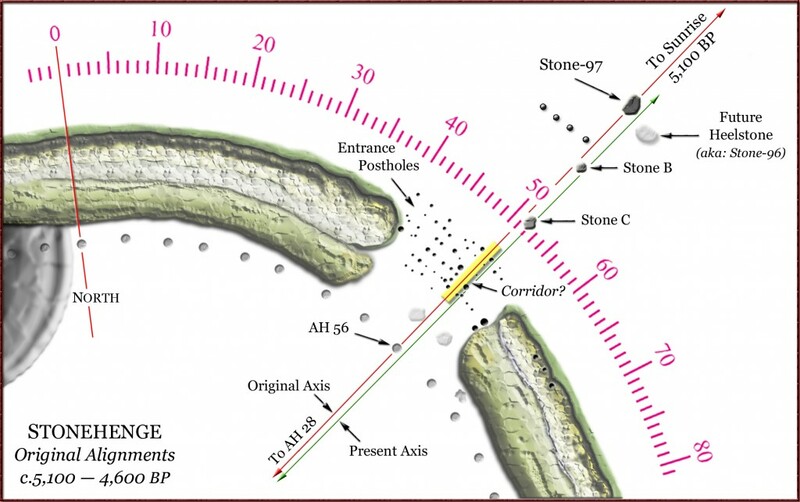 ‘The original axis at Stonehenge centered on Stone-97 and passed uninterrupted through the northeast causeway. Notice how it whisks by Stones -B & -C, crosses directly over Aubrey 56, then travels through the center of the monument and out over Aubrey 28. The entrance postholes appear to accommodate a vacant corridor for this line, which is ushered on the exterior by two large, equidistant uprights, with two smaller version on the interior. The sunline occurs at 510 from north. Hints at Avebury and elsewhere indicate the builders knew that Earth is a sphere, so by using some simple geometry they could have roughly determined the cardinals ─ no stars or magnets required. This tells us that they were well aware of Stonehenge’s actual latitude on the globe, regardless of the four slightly incorrect compass orientations. These things were determined by the sun alone, but it was a long time before the errors became a nuisance, or were even relevant to what they were demonstrating. Later, because the sun inexorably slipped 10 east, the green arrow shows a new sightline at 520. See how it now bumps into several obstacles and misses the two key Aubrey Holes altogether. This recalibration also slipped the cardinals and equator east, creating a different center for the monument, which means it cannot have been original, while the shifted compass neatly retained 510. Today the sunline is a half-degree even further east. So then, during the stone phase remodel a few hundred years on, the new builders not only corrected the old mistakes, but also conveyed a more sophisticated theme. It became, not the mystery of what Sun was, but the certainty of what it did. As its original placement blocked the sunrise, they rotated Stone-97 into the present Heelstone position. This indicates that it was the sightline which became important, and we see a number of offset stones at the complex which showcase this aspect. (Stonehenge is not the only monument to do this). However, in the Heelstone’s case it didn’t matter where the sun rose as long as it peened off the high crown to create that long, pointed shadow through the Circle, into the cup of Trilithons, landing at the Altar Stone. In future, the Entrance Stones ─ Stone-E and the Slaughter Stone ─ would also play a role in this decidedly male aspect. A two-dimensional map gives us a picture. The three-dimensional landscape lends texture. Time’s fourth dimension factors sequence, and it’s only here we can hope to resolve intent. When we scratch in the chalk, we’re seeing the beginning, middle and end of a progression which, to my eye, clearly shows that Stonehenge wasn’t constructed as a finished monument in stasis with death as the emphasis, but rather crafted over centuries by a culturally morphing people whose early mistakes were corrected by far deeper understanding and a much more experienced world view. The fabled complex now represented the eternal cycle of life with the equal role of male and female.’ © 2017 by ND Wiseman All Rights Reserved This excerpt has been expanded from Page 19 of Stonehenge and the Neolithic Cosmos, prepared especially for Silent Earth. Thank you to Historic England and N.D. Wiseman for cooperation and assistance provided with this article. 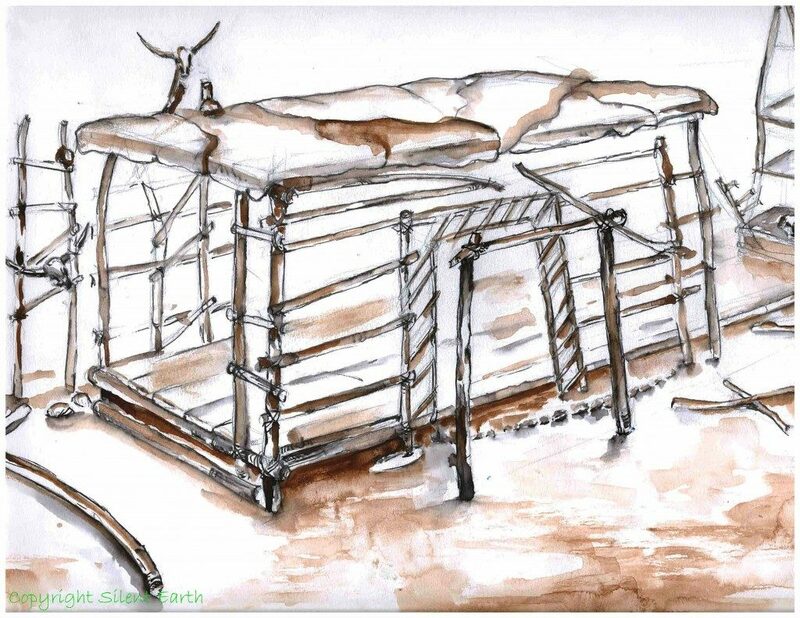 Thank you also to Peter Dunn the artist, for the thought-provoking and inspiring illustration of Stage 1 of Stonehenge used in this article. One pale as yonder wan and horned moon…’.